Combining two leading Products, UDA OnPlan Scheduling offers an enhanced system for project and contact management. With upgraded Scheduling, Contracts, and the all new Items Database, Integrated Calendar, Resource Allocation, and ConstructionNet CRM, UDA ConstructionSuite CM delivers the next step in total information control. Get Started in Minutes - OnPlan Scheduling CM is available for immediate download. 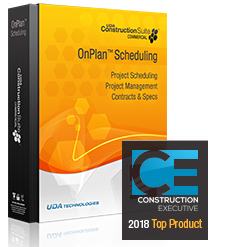 Purchase includes OnPlan Scheduling CM License, SuiteLink Integration with ConstructionOnline, Basic Support, Updates, and Upgrades.